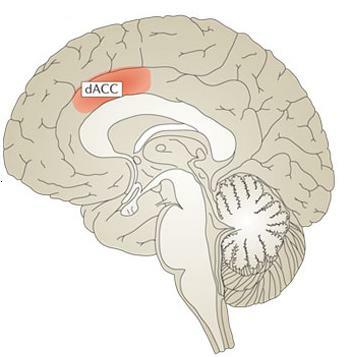 Human dorsal anterior cingulate cortex (dACC) includes the cingulate gyrus and cingulate sulcus from the levels of the genu of the corpus callosum anteriorly to the anterior commissure posteriorly. The human dACC has been implicated in various aspects of action selection, including reward-dependent decision making, conflict monitoring and representation of error likelihood. A smaller body of work has suggested that human dACC could influence action initiation apart from its role in action selection. A fundamental question is whether action selection and action initiation are separable functions of dACC 1). Tinnitus distress has been linked to increased beta oscillatory activity in the dorsal anterior cingulate cortex (dACC). The amount of distress is linked to alpha activity in the medial temporal lobe (amygdala and parahippocampal area), as well as the subgenual (sg)ACC and insula, and the functional connectivity between the parahippocampal area and the sgACC at 10 and 11.5 Hz. De Ridder et al describe 2 patients with very severely distressing intractable tinnitus who underwent transcranial magnetic stimulation (TMS) with a double-cone coil targeting the dACC and subsequent implantation of electrodes on the dACC. One of the patients responded to the implant and one did not, even though phenomenologically they both expressed the same tinnitus loudness and distress. The responder has remained dramatically improved for more than 2 years with 6-Hz burst stimulation of the dACC. The 2 patients differed in functional connectivity between the area of the implant and a tinnitus network consisting of the parahippocampal area as well as the sgACC and insula; that is, the responder had increased functional connectivity between these areas, whereas the nonresponder had decreased functional connectivity between these areas. Only the patient with increased functional connectivity linked to the target area of repetitive TMS or implantation might transmit the stimulation current to the entire tinnitus network and thus clinically improve 2). Srinivasan L, Asaad WF, Ginat DT, Gale JT, Dougherty DD, Williams ZM, Sejnowski TJ, Eskandar EN. Action initiation in the human dorsal anterior cingulate cortex. PLoS One. 2013;8(2):e55247. doi: 10.1371/journal.pone.0055247. Epub 2013 Feb 27. PubMed PMID: 23460783; PubMed Central PMCID: PMC3584070. De Ridder D, Joos K, Vanneste S. Anterior cingulate implants for tinnitus: report of 2 cases. J Neurosurg. 2016 Apr;124(4):893-901. doi: 10.3171/2015.3.JNS142880. Epub 2015 Aug 28. PubMed PMID: 26314996. McGovern RA, Sheth SA. Role of the dorsal anterior cingulate cortex in obsessive-compulsive disorder: converging evidence from cognitive neuroscience and psychiatric neurosurgery. J Neurosurg. 2016 Apr 1:1-16. [Epub ahead of print] PubMed PMID: 27035167.